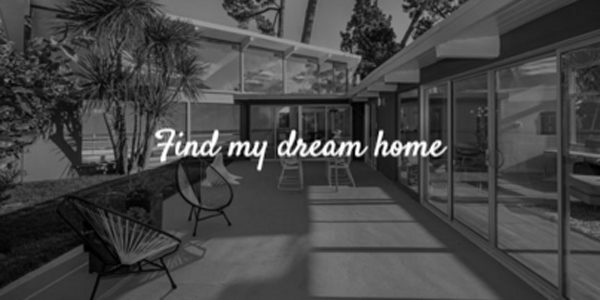 Click the map below to see these Faircrest Heights and surrounding neighborhood properties available to tour this weekend on Saturday, January 19th through Sunday January 20th. Click the map below to see these Faircrest Heights and surrounding neighborhood properties available to tour this weekend on Saturday, January 12th through Sunday January 13th. Click the map below to see these Faircrest Heights and surrounding neighborhood properties available to tour this weekend on Saturday, January 5th through Sunday January 6th. According to the report, Los Angeles renters paid nearly $2 billion more during 2018 than the year before. 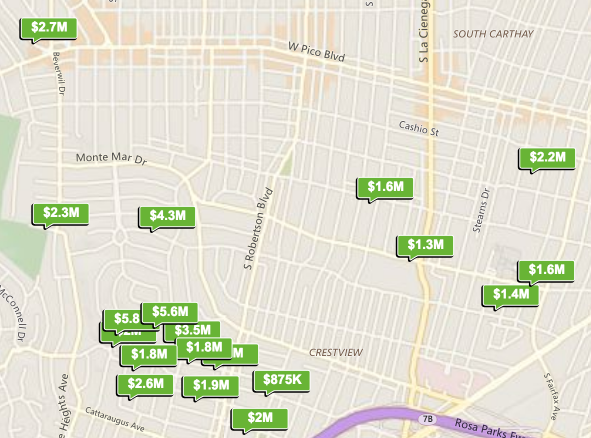 It’s no secret that Los Angeles rental prices are some of the highest in the nation, but a new analysis from HotPads, a rental database owned by Zillow, illustrates just how much tenants collectively spend on housing each year. 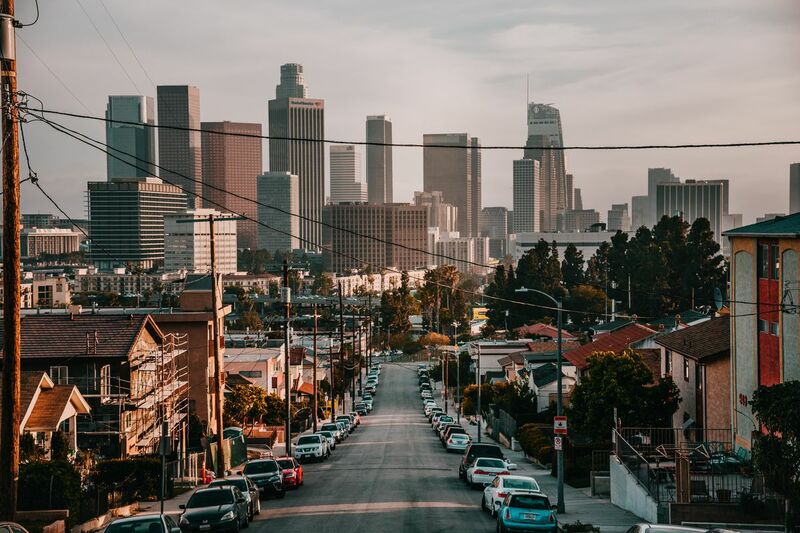 According to the report, renters in the LA metropolitan area, which includes Los Angeles and Orange counties, paid $40.4 billion in rent during 2018. By comparison, that’s more than 423 of the companies on the most recent Fortune 500 list earned in yearly revenue. Los Angeles was second only to New York in terms of total rent paid, and Angelenos accounted for an astonishing 12 percent of the $504.4 billion spent on monthly rent in the United States during the past year. LA tenants coughed up around $1.9 billion more in rent during 2018 than the year before, according to the report. 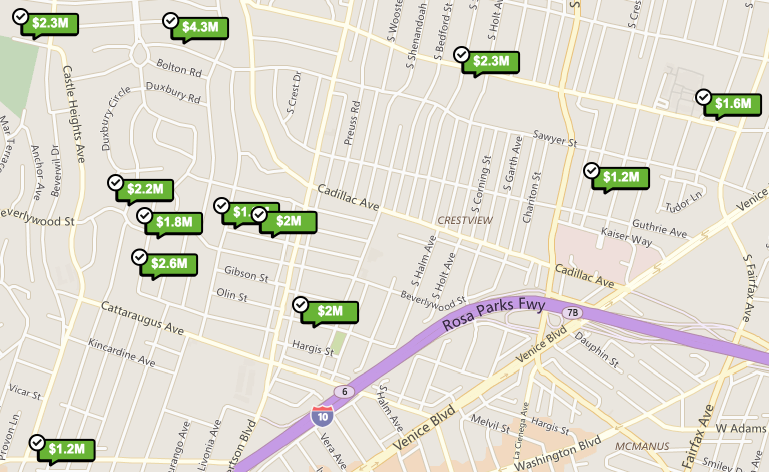 But if recent trends continue, local renters may see costs level off a bit in the year to come. 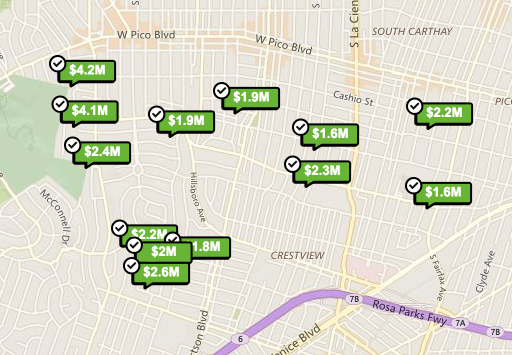 Within the city of Los Angeles, prices dipped slightly in December, according to a separate report from Apartment List. The median cost of leasing a one-bedroom apartment was $1,360 during the month, down from $1,370 in November. Two-bedroom prices also dipped slightly during the month. They dropped to $1,750, after sitting at $1,760 since late summer. Those prices are still up since the same time last year, but only by about 1.5 percent. That’s about half the yearly increase allowed under the city’s Rent Stabilization Ordinance, suggesting that LA’s competitive rental market has cooled off significantly since the beginning of the year. But those numbers only tell part of the story. 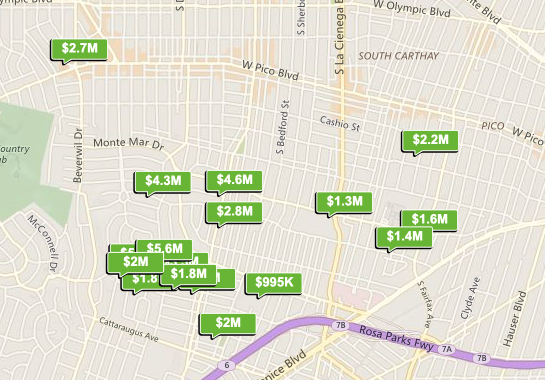 Apartment List bases its calculations on U.S. Census data, giving a decent idea of what Angelenos are paying for rent right now. 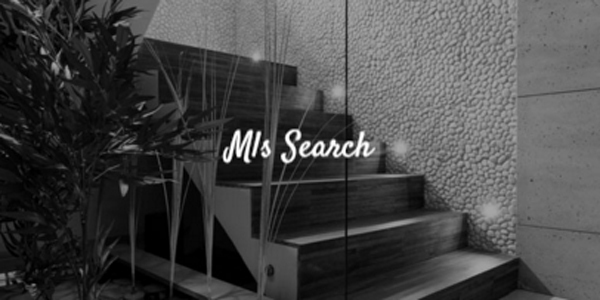 Meanwhile, real estate analyst CoStar uses active listings to get an estimate of what prices those looking for a new apartment are likely to find when searching online. According to CoStar, the average price of a one-bedroom in Los Angeles County was $1,703 in December. Two-bedroom apartments commanded prices of $2,166. 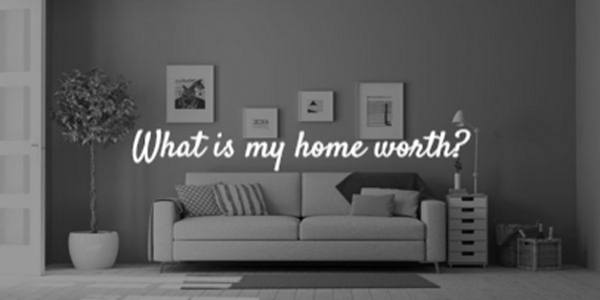 Each of those figures represents an approximately 3 percent increase over a year earlier, but prices have barely budged in the second half of the year. Between July and the end of the year, prices for both one- and two-bedroom units rose less than a percentage point. 2018 proved to be another tough year for the city of Angels. We watched devastating fires sweep across our hillsides. We struggled to build more homesto address an increasingly escalating crisis. We gasped as the Dodgers lost the World Series for the second year in a row. But fear not, Angelenos, the future is bright! From the nearing completion of game-changing transportation projects, to the reopening of beloved cultural icons, to policies that will make the city more accessible to all, this will be the year that reaffirms LA’s role as the best place in the world to live—and these 19 things will make it even better. 1. Metro’s big bus plan. Promising nothing less than a total overhaul of the region’s bus network, Metro’s NextGen bus study intends to make sweeping improvements needed to reverse years of ridership declines. The 18-month study continues with 10 community meetings during January and February, with some major changes to be rolled out by the end of the year. 2. The Music Center Plaza reopens. Essentially untouched since 1964, the sweeping midcentury plaza between the Mark Taper Forum and Dorothy Chandler Pavilion will complete its $40 million renovation this year, welcoming a restaurant and wine bar as well as more seating and much-needed public restrooms. 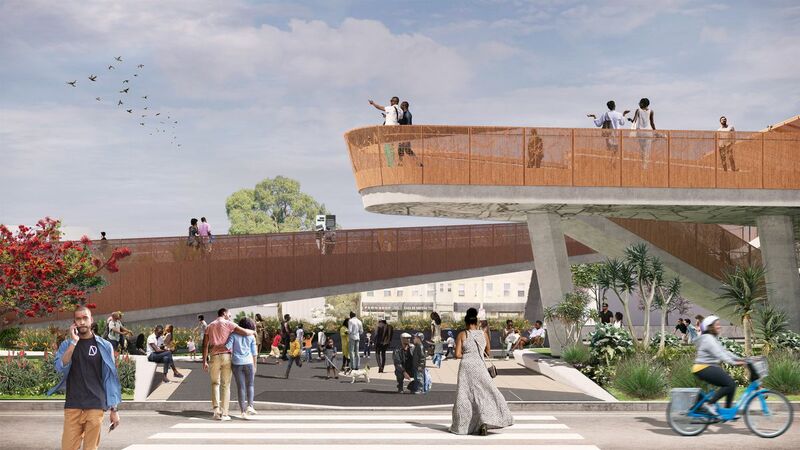 A rendering of the LaKretz Bridge, which will help people on foot, bikes, and horses get from Atwater Village to Griffith Park by the end of 2019. 3. A new bridge over the LA River. Construction is already underway on a bridge over the LA River that will help pedestrians, cyclists, and horses get from Atwater Village to Griffith Park. (In the meantime, keep track of the ongoing river path closures.) 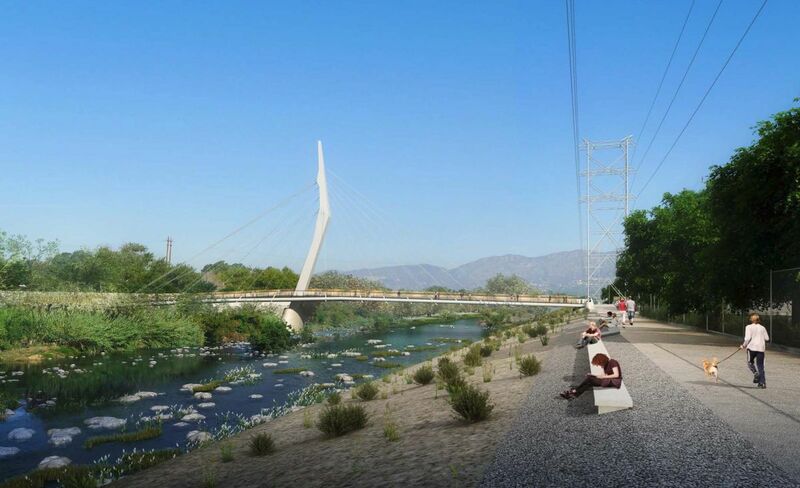 It’s the first of three new pedestrian bridges planned for the river: An Elysian Valley-Cypress Parkconnection is also under construction; another will connect Glendale to Griffith Park. The Sixth Street Viaduct connecting the Arts District to Boyle Heights will be open next year. 4. Bosch is back. 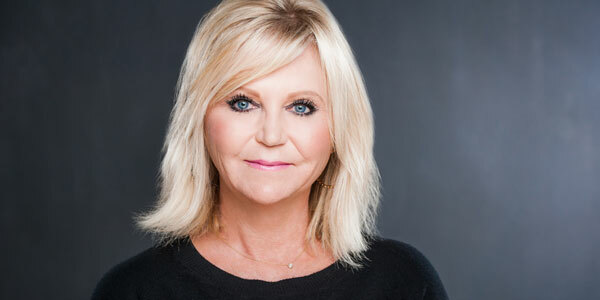 Based on former Los Angeles Times journalist Michael Connelly’s crime novels, the modern noir Amazon series features some of the most realistic depictions of LA neighborhoods. 5. More affordable housing near transit. Over 9,000 units have been approved by the transit-oriented communities program, which gives developers incentives for building within a half-mile of transit stops, and 20 percent of those units are set aside for low-income families. And now there’s the new approved Expo Line plan, which allows builders to add more density near five light-rail stations, including a tiny upzoned triangle-shaped pocket of West LA. It’s no Minneapolis, but it’s a start. 6. Tartine’s Manufactory. The crown jewel of The Row’s Arts District complex will finally open in 2019 with 40,000 square feet of coffee roasting, bread baking, and multiple dining options from the famed San Francisco bakery Tartine and Phoenix-based Pizzeria Bianco. Now if only The Row could do something about its transit-unfriendliness. 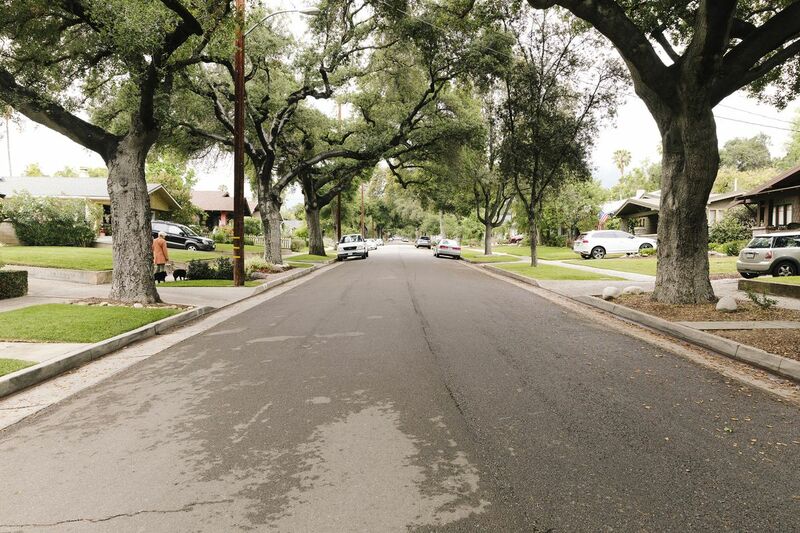 Los Angeles is focusing on protecting its mature street trees, like these in Pasadena’s Bungalow Heaven. 7. LA finally addressing its tree problem. 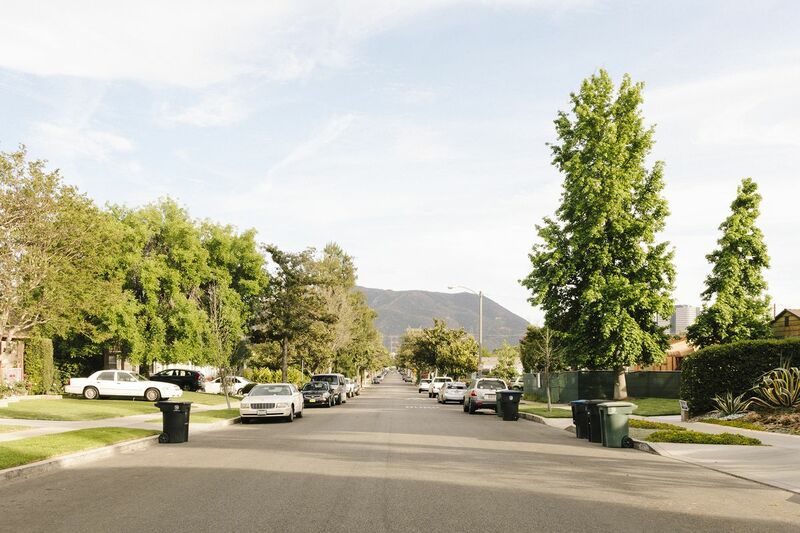 It’s no secret that LA’s tree canopy is in serious trouble. In December of 2018 the city released a “first step” plan for a badly needed urban forest management plan and posted an “emergency” job description for a citywide forest officer. City leaders are also paying more attention to the problem: 14 ficuses slated to be chopped down will be saved, thanks to a hail-mary from Los Angeles City Councilmember David Ryu, and city foresters are demonstrating creative paving solutionsto keep mature trees while fixing sidewalks. 8. A film museum in an old department store. Set to open in 2019, a Renzo Piano-designed addition to the LACMA campus will host the Academy of Motion Picture Arts and Sciences museum in the former May building and a giant orb-like appendage. 9. Target Husk comes back to life—for real this time. Consider it a Christmas miracle. In the final days of 2018, a judge ruled that construction can resume on an infamously unfinished East Hollywood Target. Hopefully it starts with reopening the Sunset Boulevard-adjacent sidewalk that’s been closed for years. 10. More backyard cottages. Thanks to a streamlined permitting process and several local incentives, the city’s planning department estimates that over 5,000 ADUs were permitted in 2018—at least 15 times as many as the year before. That could make for a significant number of units to hit the rental market this year. Metro Bike’s pedal-assist bikes are on the ground as part of a major bike-share expansion. 11. Electric bikes. At the end of 2018, Jump’s dockless electric bikes started to creep into city limits as part of LA’s new dockless permit system. Metro Bike also added a limited number of electric bikes to its system, and announced plans to expand bike share hubs into East Hollywood, Koreatown, Silver Lake, and Los Feliz. 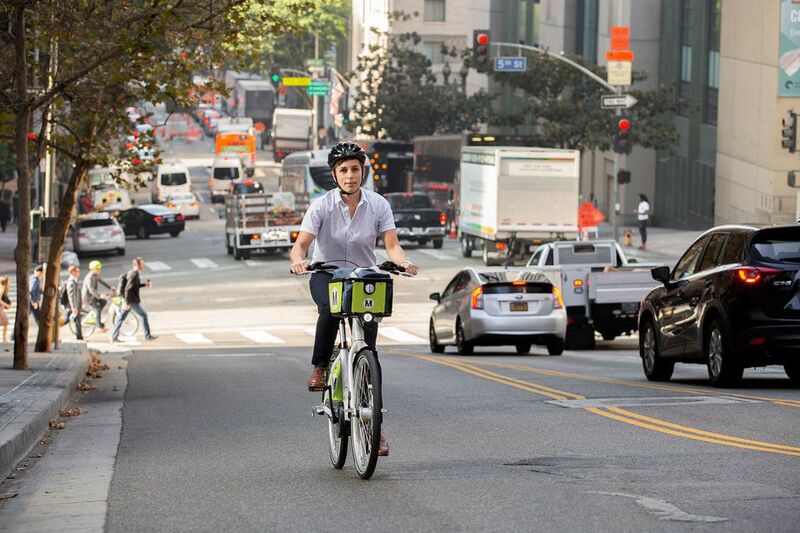 Scooters are great, but e-bikes could be a game-changer for LA’s hills and long distances. 12. Street vending for all. The legalization of street vending at the end of 2018 was a huge win for the sidewalk entrepreneurs who power the local economy. Rules went into effect January 1, and now the city will work to formalize the permitting and regulatory framework that will ensure LA’s vending culture remains vibrant, equitable, and widespread. 13. A revitalized Formosa Cafe. How many times have we been promised a proper overhaul of the legendary West Hollywood watering hole? This time it’s different, thanks to a painstaking restoration by the 1933 Group, the same people behind the Highland Park Bowl. Armed with a preservation grant and a focus on history, the hallowed space will live again. 14. Makeovers for six major streets. The city’s Complete Streets Program launched in 2018 with the announcement of a half-dozen street redesign projects meant to add safety features while reengineering the street to absorb stormwater and reflect heat. Most of the projects will be finished in the next 12 months, creating a model for how LA can future-proof its entire street network. Designed by Perkins + Will and Mia Lehrer + Associates, the outdoor museum Destination Crenshaw will feature permanent and rotating works works of art. 15. The almost-finished Crenshaw Line. Although it won’t open to the public now until 2020, the South LA line will officially be finished in December 2019. Plus this year will see all the final pieces being put into place, including Destination Crenshaw, a stunning public art installation celebrating black culture which will run 1.3 miles along the route. 16. A heads up when the next earthquake is coming. The earthquake early warning app that Mayor Eric Garcetti has promised LA just became available this week. And it’s not a moment too soon, considering there’s a 93 percent chance that an earthquake as big—or bigger—than the deadly Northridge quake will strike Los Angeles by 2037. 17. Tarantino’s vision of Los Angeles. For nearly a decade, Quentin Tarantino has been making Once Upon a Time in Hollywood, a story about the film industry in the ’60s and ’70s set against the Manson Family murders. This includes scenes where Tarantino meticulously transformed several blocks of Hollywood Boulevard storefronts and theaters into their 1969 incantations. 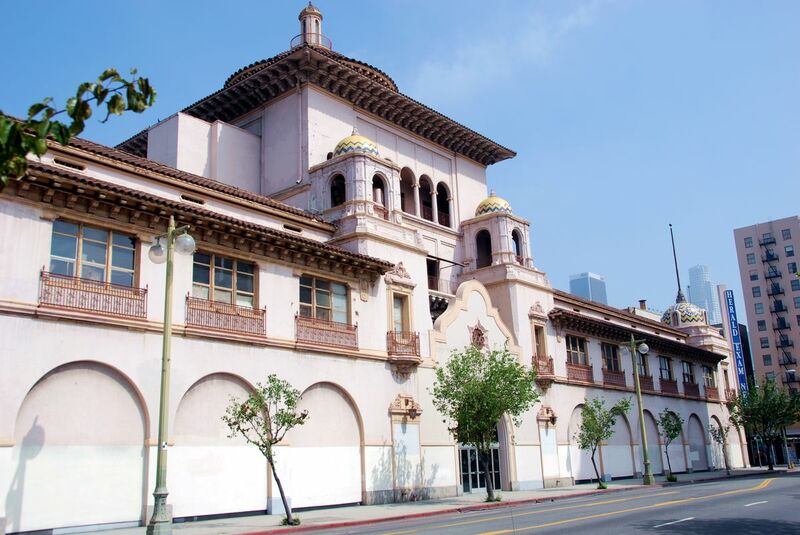 The Herald-Examiner building, designed by Julia Morgan in 1912, will reopen in 2019 after a major renovation by Gensler. 18. Getting back inside a Julia Morgan gem. Empty since 1989, the dazzling Mission Revival headquarters for the Herald-Examiner on the south side of Downtown will reopen this year after a makeover by Gensler. The Julia Morgan masterpiece—the same architect Herald-Examiner owner William Randolph Hearst hired to design his Cambria castle—will include two restaurants by Republique’s Walter and Margarita Manzke: One in the ornate lobby and another in the parade of arches newly opened to the street. 19. A nice walk to a baseball stadium. Why would anyone want to get there in slow-moving traffic, on a theme-park ride or through a hole in the ground? We’ve got the best weather, the best fans, and a ballpark in a 600-acre actual city park. A stroll to Dodger Stadium remains the best way to celebrate everything our city has to offer, preferably just before we claim that long-awaited World Series victory. 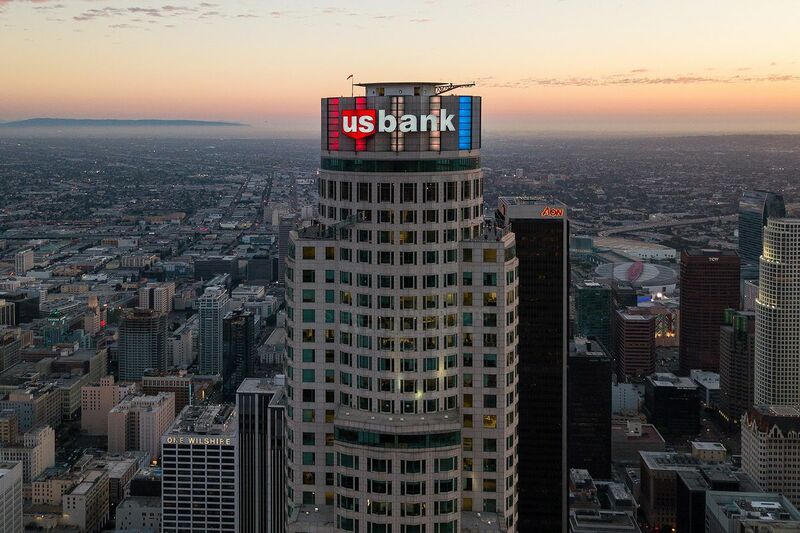 But you could also do it this weekend to watch the sun set behind Downtown’s skyline—and help remind you just how good LA’s got it. An enormous Santa Claus greets shoppers at the May Co. department store in North Hollywood in 1964. The year is 2018 and shopping malls sit empty, while once-mighty retailers like Sears shutter stores with reckless abandon. But it wasn’t always this way. 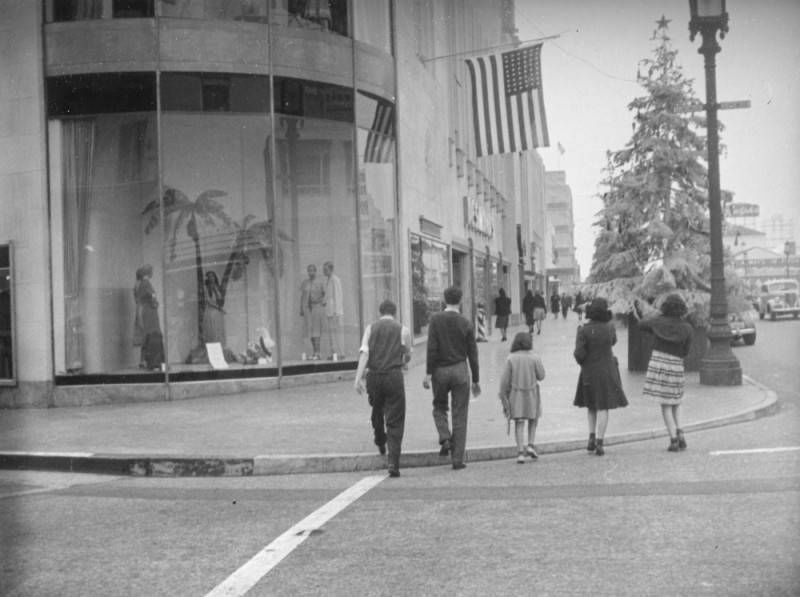 Long before Amazon Prime, residents of Los Angeles—and the United States at large—spent countless tired hours during the holiday season pushing through crowded department stores searching for gifts and the occasional bargain. 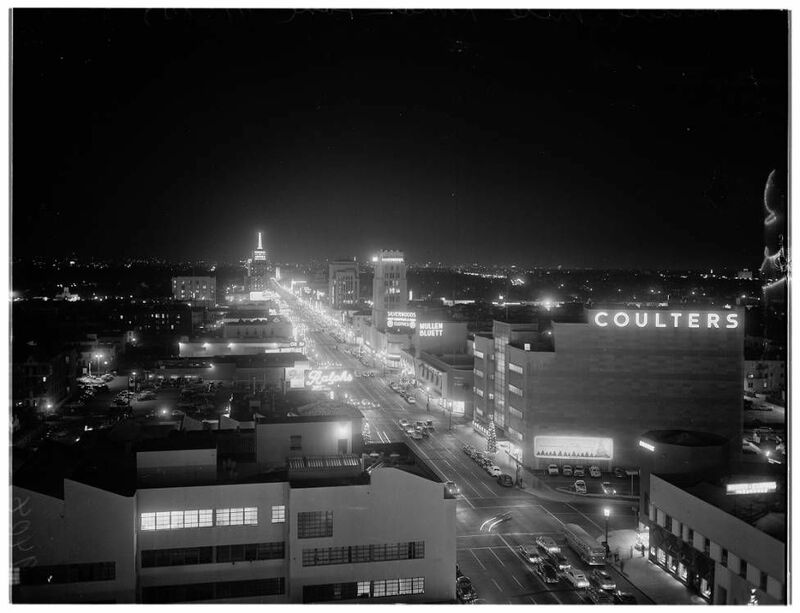 One of the fastest-growing cities on the West Coast in the 20th century heyday of the department store, Los Angeles was home to legions of towering shopping complexes that competed fiercely for customers—particularly during the last weeks of the year. 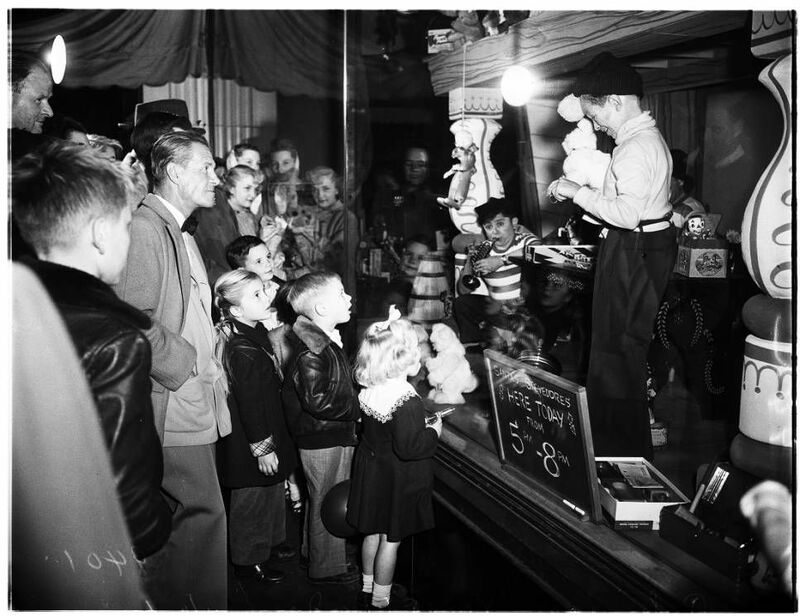 Stores like Bullock’s, Coulter’s, Robinson’s, and May Co. attracted flocks of holiday shoppers with elaborate window displays, towering Christmas trees, and the chance to speak to Jolly Old Saint Nick himself. 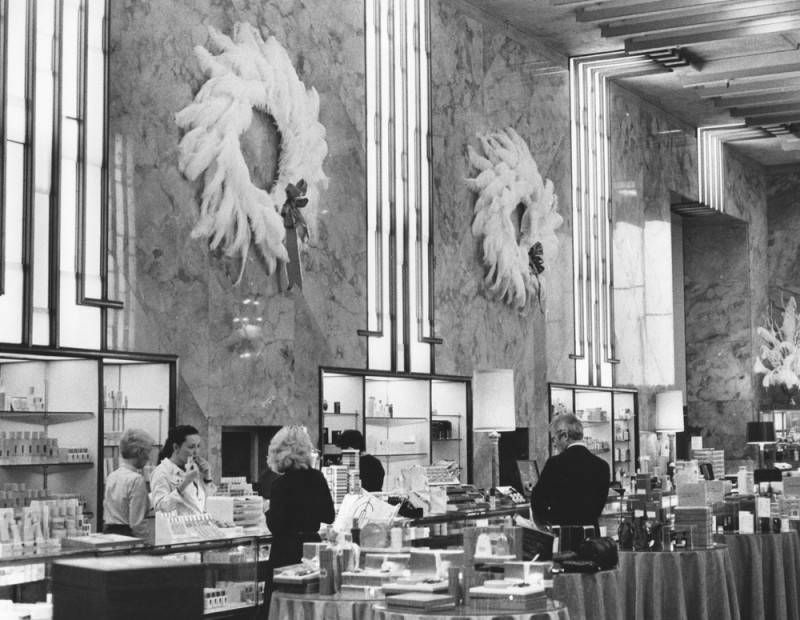 Here’s a look back at the LA department stores that were once go-to destinations for holiday gifts of all kinds. Dated photos are in chronological order. On December 28, 1888, the Hamburgers store in Downtown LA (then known as the People’s Store; photographed above in 1890) explained in the Los Angeles Times that the holiday season had been such a busy one that no one at the company had found the time to place ads in the paper the week before. The store’s daily barrage of column-length advertisements continued as usual after that. 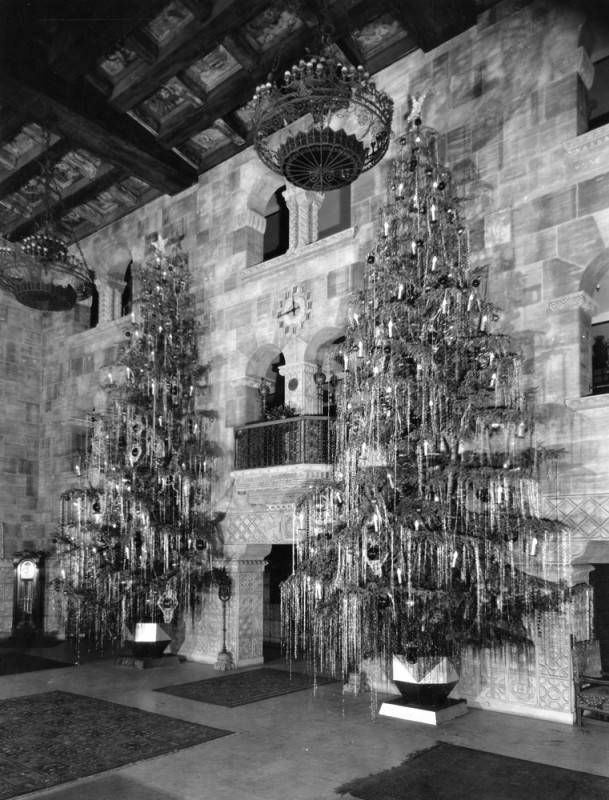 Towering Christmas trees could be found in the ornate lobby of Downtown’s Barker Bros. furniture store in 1929. 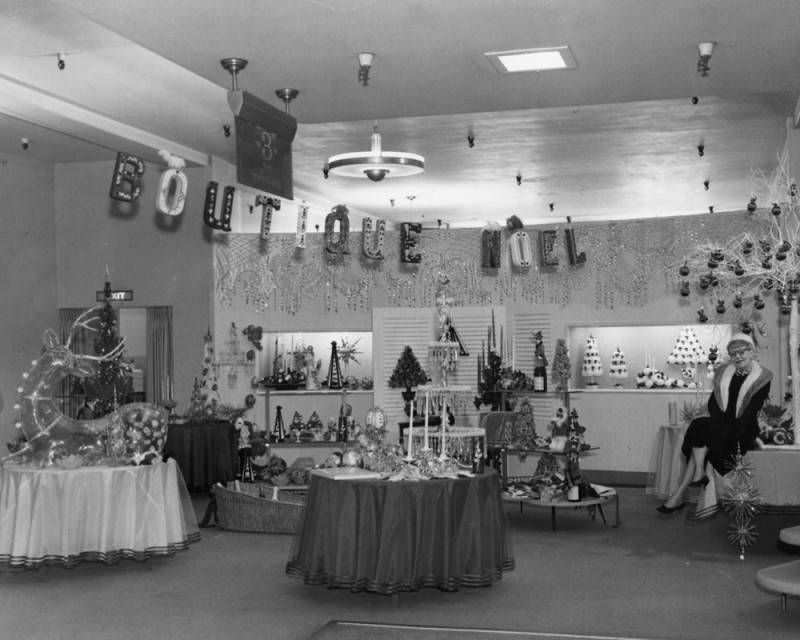 Desmond’s department store on Wilshire Boulevard, seen here in the 1930s, complements an interior palm tree display with a giant Christmas tree placed in front of the entrance. Another Christmasy display at Desmond’s (the sign reads “Everybody wants a gift from Desmond’s”). 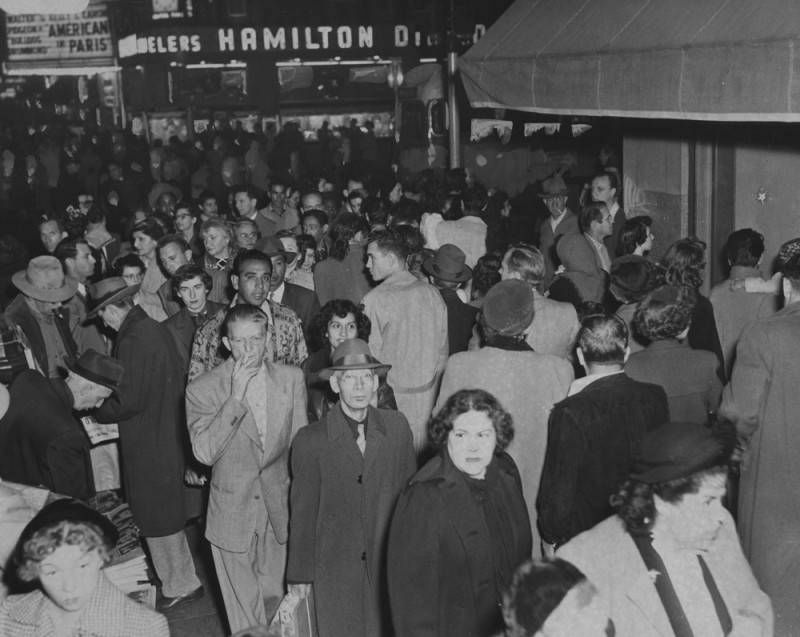 Crowds pack Broadway in December 1951. Even during the busy holiday season, most stores closed their doors at 9 p.m. sharp. 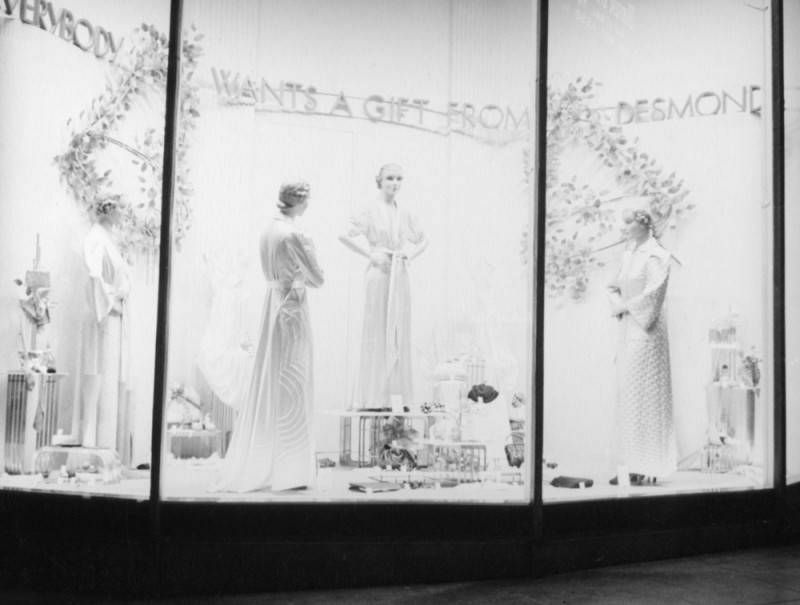 Department stores on Broadway competed for customers with elaborate window displays accompanied by music played over loudspeaker at peak shopping hours. 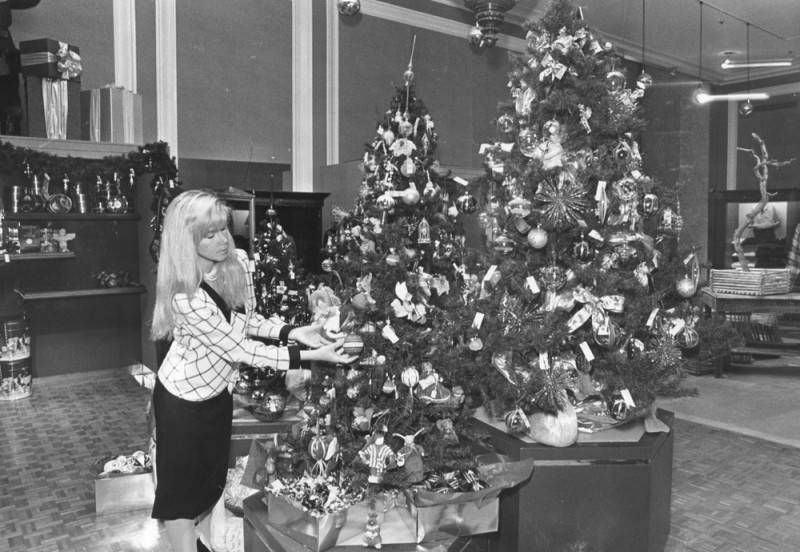 Christmas trees line the Miracle Mile in the early 1950s. 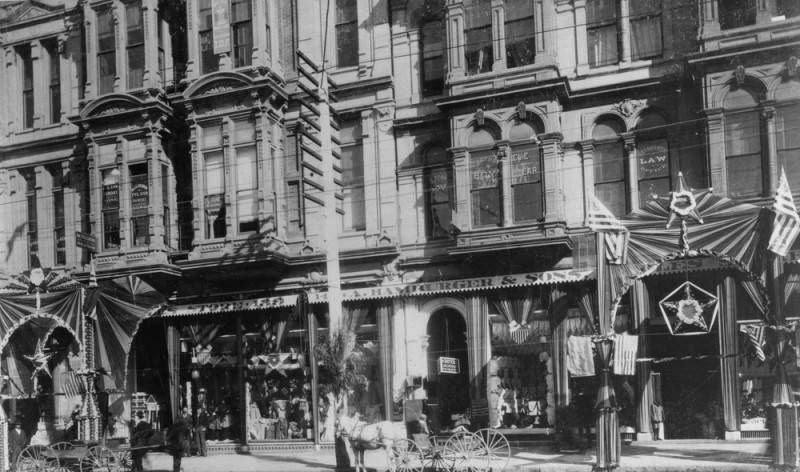 In the foreground is Coulter’s, which was demolished in 1980. May Co. opened its Wilshire Boulevard store (soon to become the Academy Museum of Motion Pictures) in 1939. 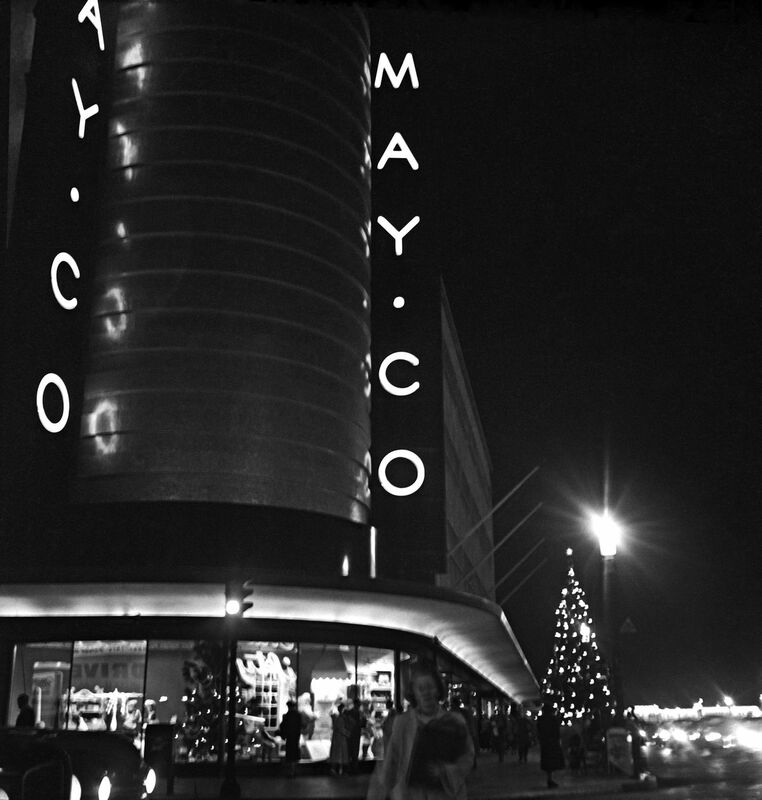 It’s seen here in 1951, fronted by a tall, illuminated Christmas tree. Most stores put out holiday-themed displays in the final months of the year. 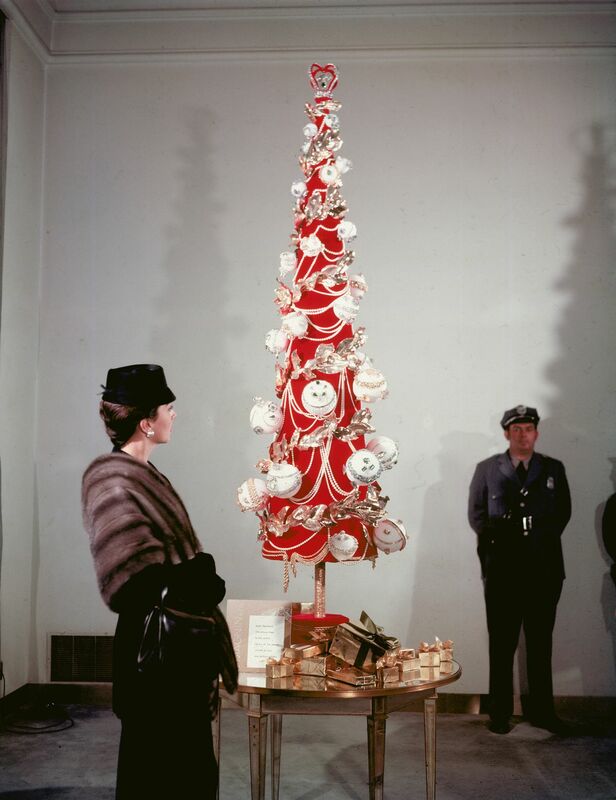 Wilshire Boulevard’s stately I. Magnin exhibited a bejeweled Christmas tree in 1955 that the store claimed was worth $1.5 million. Once in place, the tree was given its own security detail. 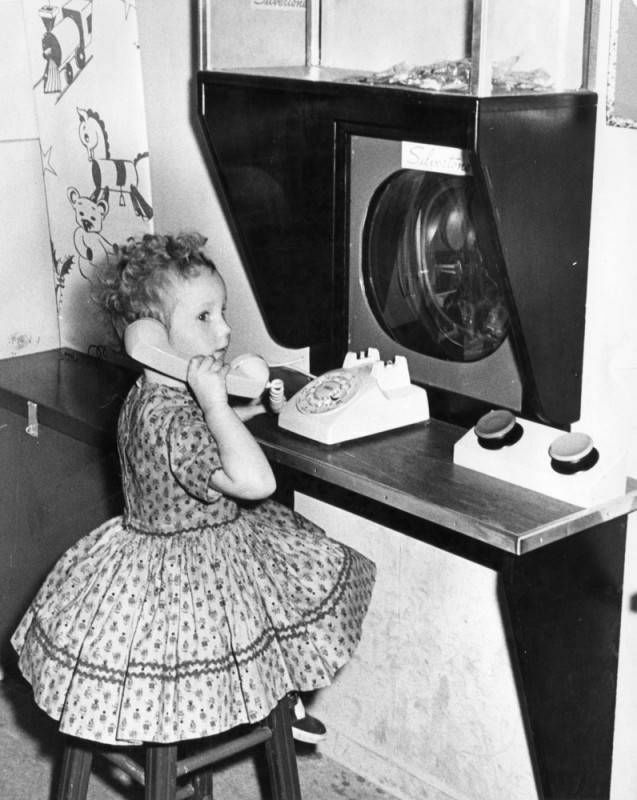 In 1960, the North Hollywood Sears set up phone stations where kids could call the North Pole. The store’s resident Santa answered the phone from a nook behind the wall. 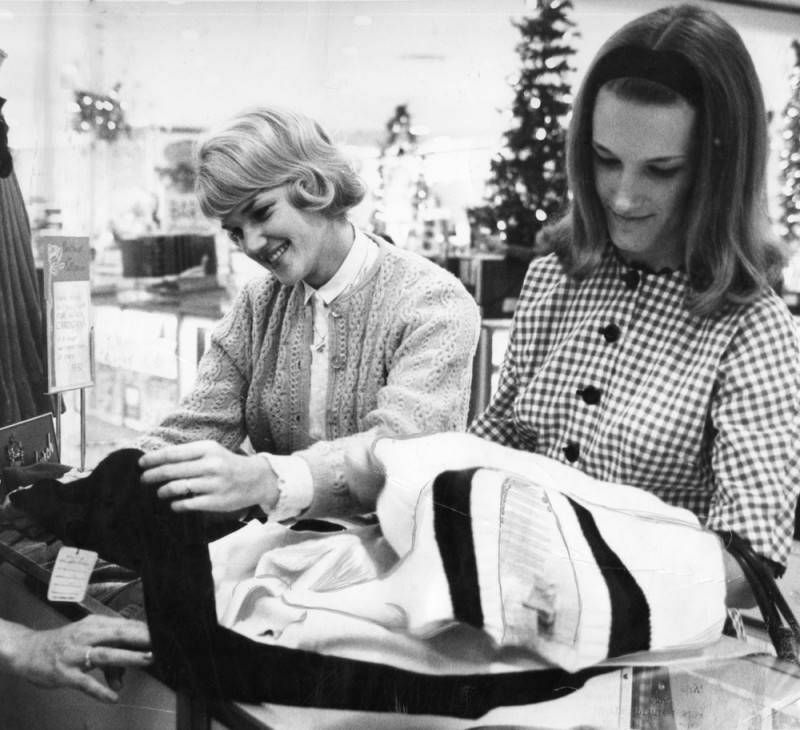 Gift shopping at the Panorama City Robinson’s store in 1962. 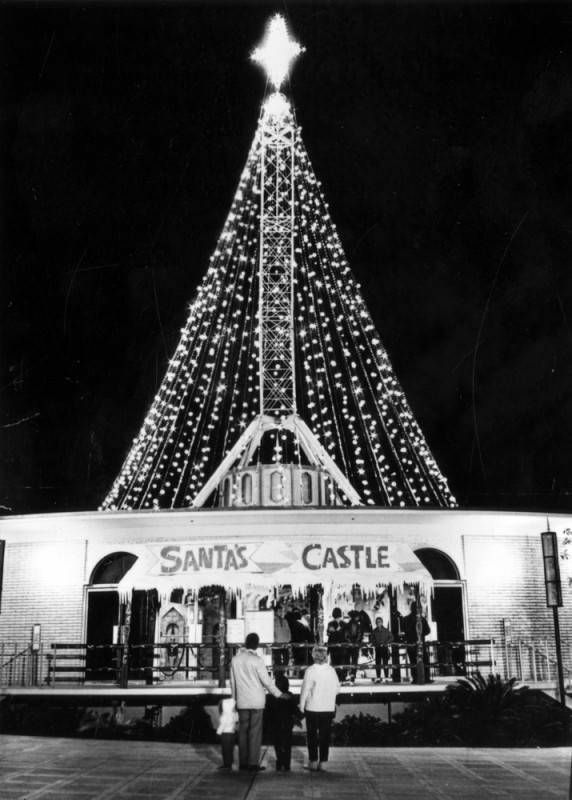 Bullock’s outfitted its new location at Sherman Oaks Fashion Square in 1963 with a large holiday attraction called Santa’s Castle. 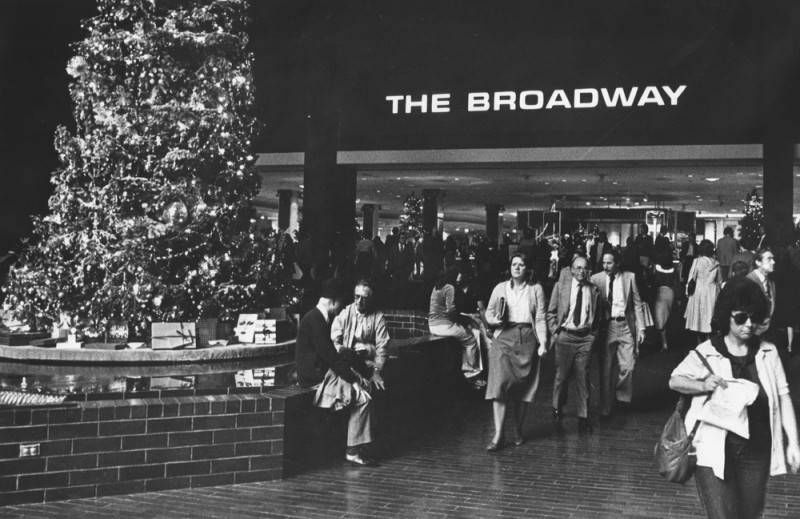 In the 1980s, Downtown LA’s Broadway Plaza struggled to attract holiday buyers. The shopping center became Macy’s Plaza in 1996 and The Bloc in 2016. Click the map below to see these Faircrest Heights and surrounding neighborhood properties available to tour this weekend on Saturday, December 15th through Sunday December 16th.